This pregnant right whale was killed when it was hit by a boat. Displayed with the fetus skeleton in situ, it now serves as a species ambassador. 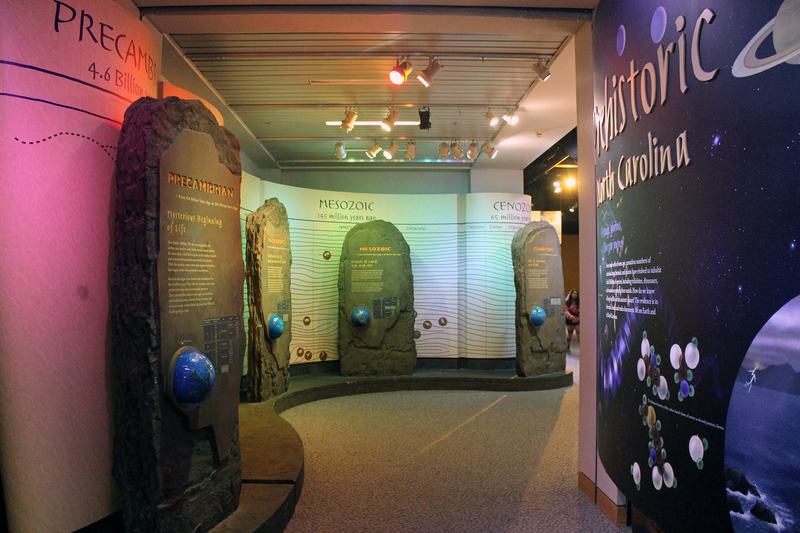 The North Carolina Museum of Natural Sciences has been on my list of must-see museums for some time, and I finally had a chance to visit over Memorial Day weekend. Founded in 1879 as the North Carolina State Museum, the institution was initially a showcase for local agricultural and mineral products. Over the years, the interests of both the curators and the visiting public gradually nudged the museum in the direction of more generalized natural history. 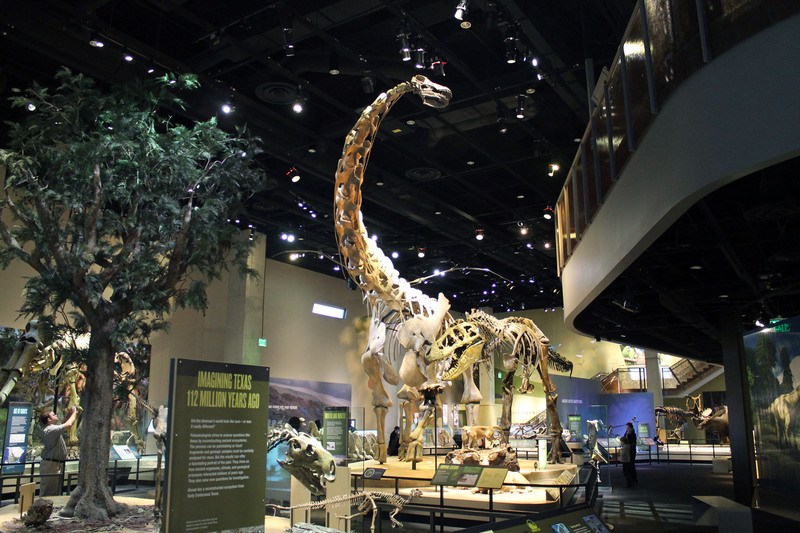 Now the largest natural history museum in the southeast, NCSM hosts a world-class research staff overseeing a collection of 1.7 million specimens. Since 2000, the museum has occupied a four-story facility in downtown Raleigh. A second wing, called the Nature Research Center, opened in 2012. There are also two satellite nature centers outside the city (which I did not visit) that are under the NCSM banner. An introduction to geologic time. First things first: the paleontology exhibit is quite good, although somewhat compact. Perhaps too compact, given its popularity and the amount of exhibit space the museum has to work with overall. Coming up the escalator to the 3rd floor, visitors are strongly encouraged to enter Habitats of North Carolina, a colorful and attractive walk through time. The initial spaces cover the basics. First, a series of pillars introduce the primary stages of life on Earth. This is followed by exhibits about where fossils come from, how we know how old fossils are, and so on. I particularly liked the “What to Fossils Tell Us?” display. Here, a grid of spinning cubes each hold small, conventional fossils. Visitors can rotate the cubes around to see that even these modest-looking remains can be very informative. For example, leaves and pollen provide detailed climate information, and a large croc scute suggests that a substantial body of water was present. Prestosuchus in the Triassic scene. This appears to be a cast of the Brazilian AMNH 3856. 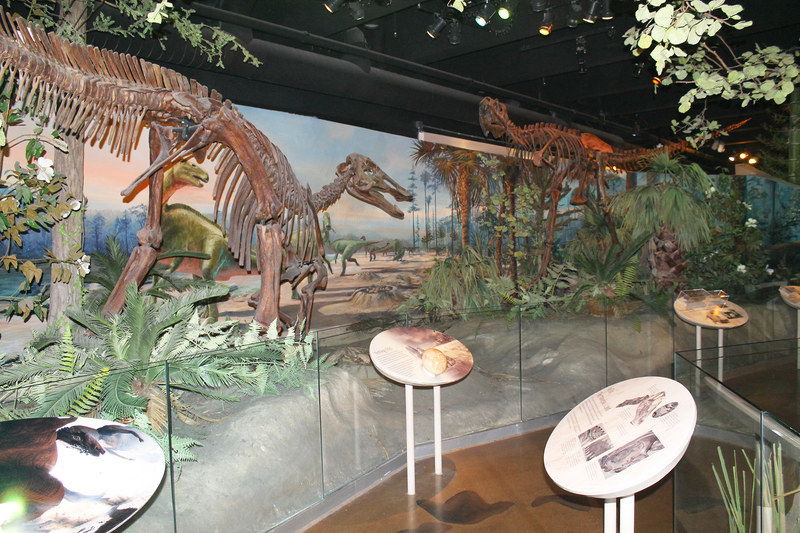 Edmontosaurus and Albertosaurus casts dominate the Cretaceous tableau. The rest of the exhibit is built around a series of tableaus in which mounts and models of charismatic animals are placed in landscapes of replica foliage. Small, illustrative fossils are in cases throughout. First up is a cast of Prestosuchus, lurking among some Triassic horsetails. Next, Edmontosaurus, Albertosaurus, and Pachcephlosaurus casts populate the Cretaceous alongside lovely ginkgos and magnolias. 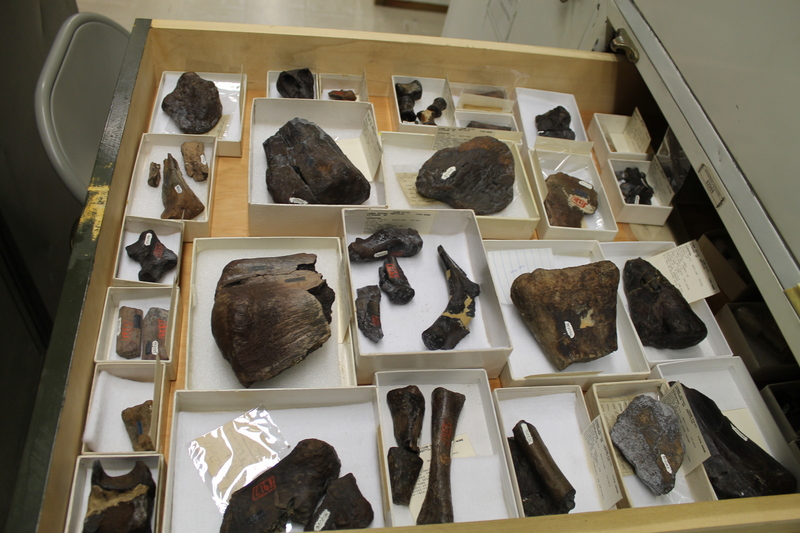 A baby hadrosaur model at the feet of the Edmontosaurus was apparently stolen (and recovered) in 2012. 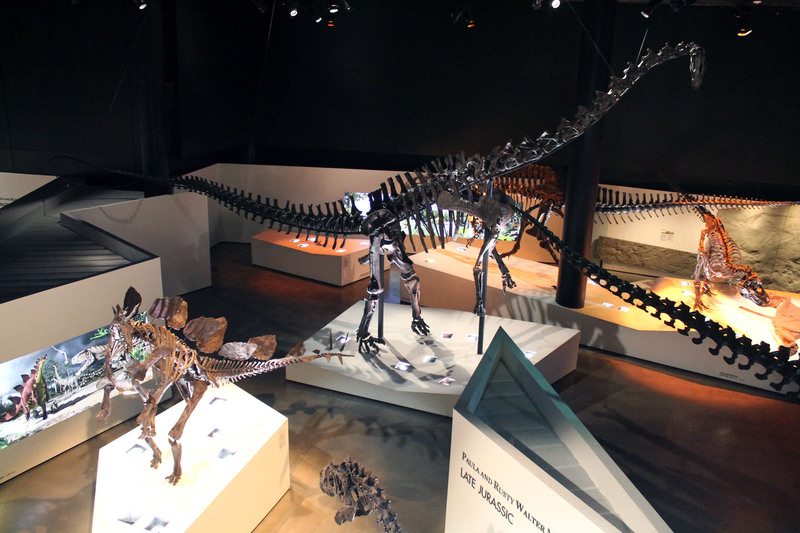 The famous Willo – a Thescelosaurus skeleton that maybe/probably doesn’t have mineralized heart tissue in its chest – is on display under glass. Did you know that most modern fish groups evolved only 20 million years ago? I didn’t! A ground sloth in the standard pole-dancing pose. 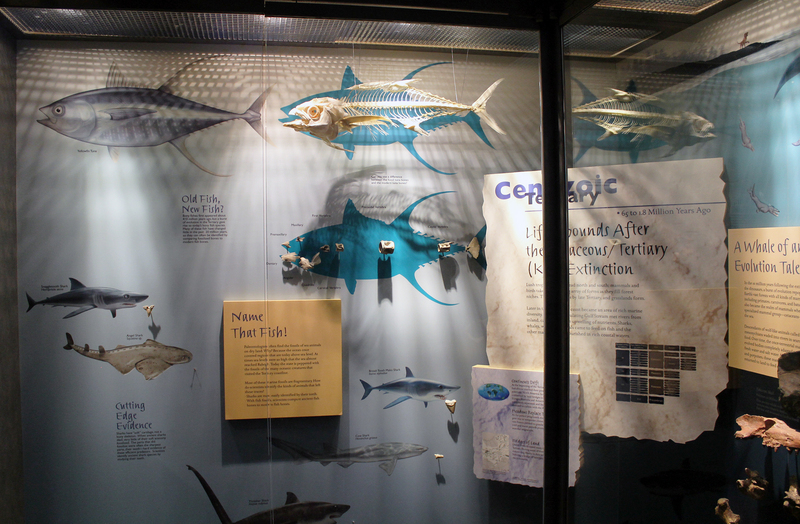 Moving into the Cenozoic, a set of attractive and informative cases describe the origin and evolution of modern fishes and whales. This is followed by glass tunnel through a life-sized diorama of a late Eocene sea. The models here are spectacular, but the space is altogether too dark. I found it difficult to see the diorama, much less read the signs. 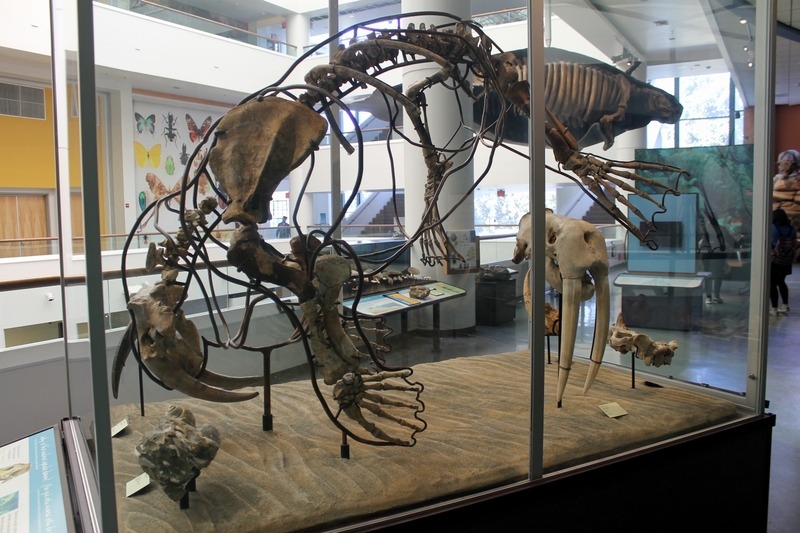 The final section is home to a real ground sloth skeleton. 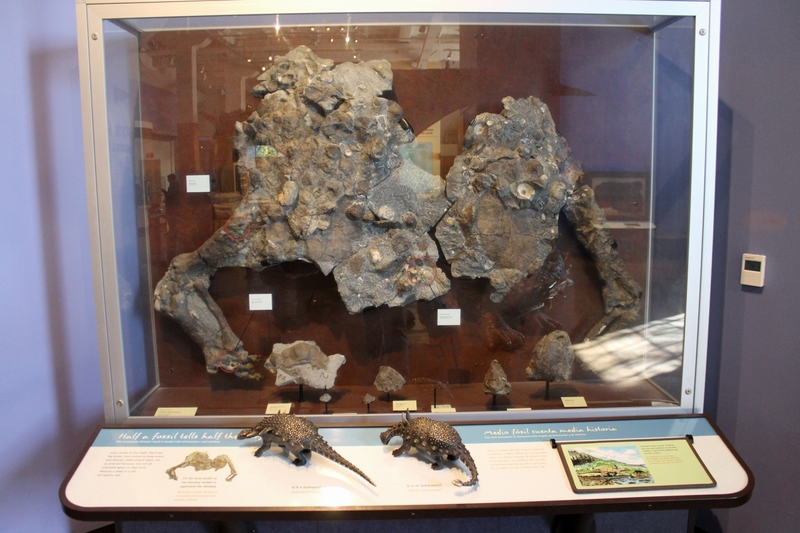 This is a composite of several specimens recovered in 1999 near Wilmington, North Carolina. Happily, the reconstructed portions of the mount are distinct and easy to see. Habitats of North Carolina ends on an eccentric note with a set of mannequins in pioneer garb discovering fossils in a creek bed. I’m not really sure what this adds to the exhibit narrative. Acrocanthosaurus holds court in a sunny atrium all to itself. The star fossil at NCNM is the only real Acrocanthosaurus on display anywhere in the world. Avocational fossil hunters Cephis Hall and Sid Love found this rare skeleton in Oklahoma in 1983. Unfortunately, a bad case of pyrite disease made the fossils an absolute nightmare to prepare, and it exchanged hands several times before ending up with the Black Hills Institute in South Dakota. 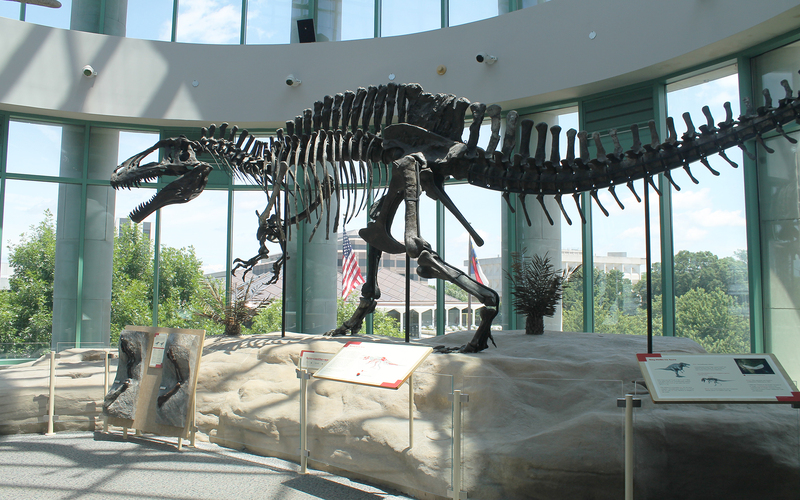 In 1997, an anonymous donor purchased the skeleton on behalf of NCNM for $3 million, shortly after the museum came in second place in the bidding war for Sue the T. rex. Acrocanthosaurus is a favorite of mine, and the mount is beautiful. The sunny atrium it’s situated in makes for an attractive display, but I wish it wasn’t so disassociated from the main paleontology exhibit. I’m told the mount included more original material when it debuted in 2000, but the creeping specter of pyrite disease has necessitated the removal of several bones for restoration and safekeeping. Be sure to see it soon, before the rest of the mount gets replaced with casts! 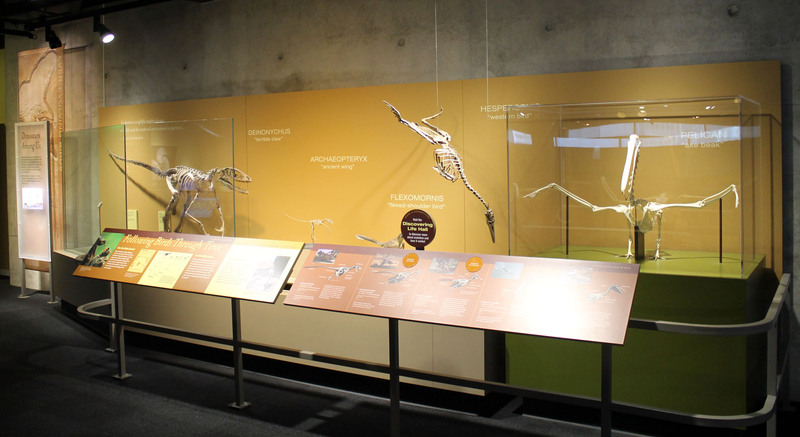 As mentioned, however, a whole new wing of exhibits opened in 2012. Called the Nature Research Center, this is basically the interactive, citizen science-driven Museum of the Future that educators (including myself) have been demanding for years. This three story space is all about getting visitors involved in science. 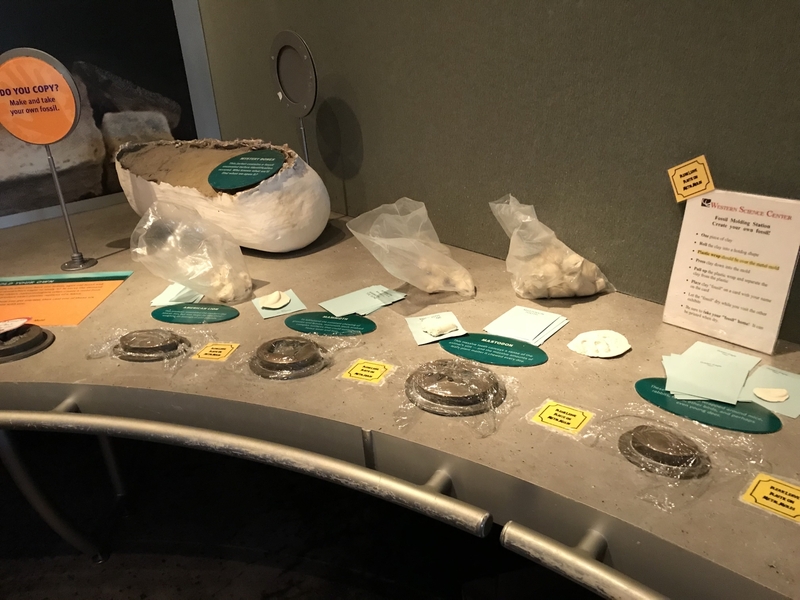 There are multiple drop-in “labs” where knowledgeable staff lead visitors through mini-experiments, designed to get people thinking scientifically. There’s a molecular lab where visitors can isolate and analyze DNA samples. 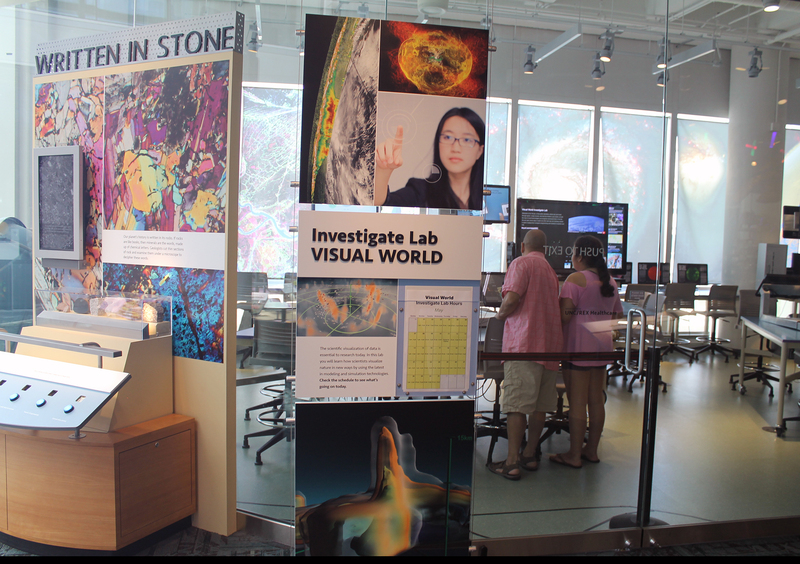 There’s a digital imagery space where visitors can practice using GIS tools, or explore the possibilities of 3-D printing. And there’s a Q?rius-like collections library, where visitors can check out and study real bones, furs, minerals, and fossils. The Nature Research Center also includes several fishbowl-style labs where visitors can watch museum staff and volunteers at work. Even the highly interdisciplinary static displays are less about the “what” and more about the “how”: the tools, techniques, and people that make science possible. One of the lab spaces in the Nature Research Center. Distressingly, on the day I visited, the traditional museum exhibits were crowded with visitors, but the Nature Research Center was nearly deserted. Since I was there on a holiday weekend, I was probably seeing a skeleton-crew version of the staff that is usually facilitating the interactive spaces. Still, the Nature Research Center is the embodiment of the modular, interactive exhibits that educators dream about. To see it empty while the story and object-driven exhibits were packed is somewhat disconcerting. As the scientists say, though, a single anecdotal experience is not data. I’d be very interested to learn how this pioneering exhibit space holds up in the long run. Phylogenetics is the study of the evolutionary history and relationships among extant and extinct organisms. More than any other organizational scheme, this is the way biologists think about the living world. In vertebrate paleontology in particular, an understanding of the evolutionary relationships of animals as identified via minute anatomical details is absolutely fundamental to our science. One might even argue that most new discoveries and inferences in this field are meaningless without some knowledge of the basic shape of the tree of life. 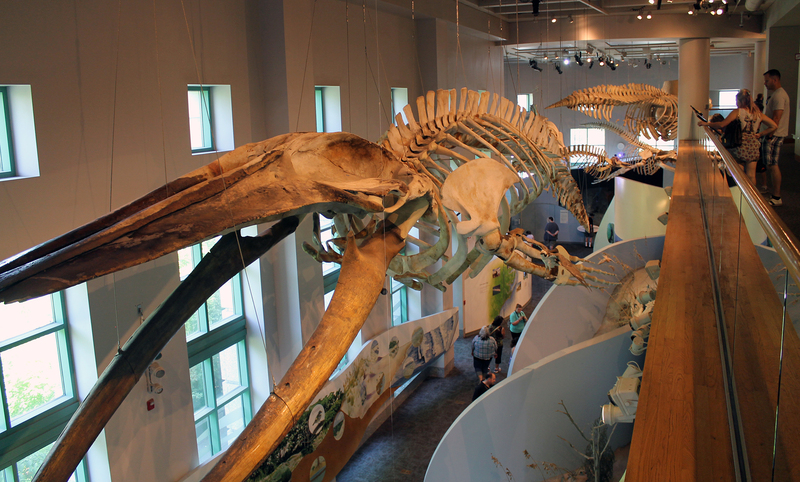 Did whales and dolphins evolve from marine reptiles? Did giraffes evolve from sauropods? Are [dromaeosaurs] related to cats? Are dinosaurs related to sharks? How can birds be dinosaurs if dinosaurs are reptiles? Did the plant-eating dinosaurs evolve into mammals? Are bats a kind of bird? Are pterodactyls a kind of bird? I don’t mean to ridicule or disparage people for asking these questions. Again, these all come from educated adults – museum and park visitors, undergraduate students, T.A.s, and at least one veterinarian! While these questions clearly show unfamiliarity with evolutionary relationships and how evolution works in general, they also show an effort to build a logical framework when none is available. 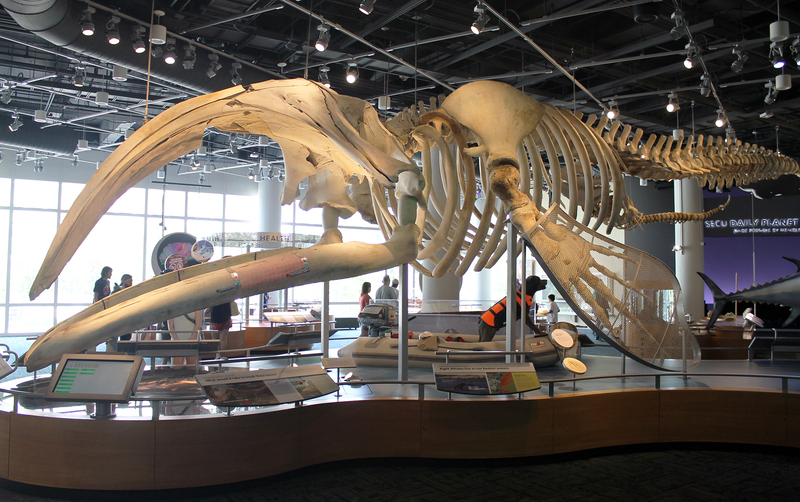 For example, when a person asks if whales are descended from marine reptiles, he or she is hypothesizing that all large marine animals are related. This is incorrect, but it’s a sensible connection to make (and one that past naturalists have certainly explored). USNM 8635, a handsome non-dinosaur. Photo by the author. The first problem is well known and has been discussed in-depth elsewhere (e.g. MacFadden et al. 2007, Spiegel et al. 2006, Spiegel et al. 2012), so I’m going to breeze over it and focus on the other three. It’s easy to toss out words like “mammal”, “reptile”, and “amphibian”, and take for granted that your audience will know what they mean. But even the most basic elements of vertebrate classification are specialized knowledge, and science communicators would do well to remember it. When I was teaching an undergraduate human anatomy course, I found that most of the class was familiar with the word “mammal”, and could name some examples. However, the students couldn’t articulate what sets mammals apart from other animals, and the relationship of mammals to other vertebrates within the tree of life was all new to them. I think this is fairly typical, even among individuals with a background in biology. People are introduced to these categories in grade school, and you’d be hard-pressed to find somebody who couldn’t tell you whether (say) a cat is a mammal or a reptile. What is missing is what that actually means. We can’t assume that just because somebody knows a cat is a mammal, they know that fur and milk glands (much less auditory ossicles, a solid mandible, and heteromorphic teeth) are things to look for when categorizing mammals. They also may not know that “mammal” is an evolutionary group – that all the animals that fall under this banner are more closely related to each other than they are to anything else. No mammal is going to spontaneously become a bird or a fish. This is obvious to specialists, but not to most of our audience. The situation is further complicated by the element of time. Somebody may know that a modern cat and lizard differ in several fundamental ways, but do they know that both groups still evolved from a common ancestor? Or that said ancestor lived more than 300 million years ago? Unfortunately, much of the public would appear to lack any knowledge of how the past is related to the present. I’ve had visitors insist on calling fossil turtles “dinosaur turtles” and Teleoceras a “rhino-saur.” For them, extinct animals (all labeled “dinosaurs”) are a category all their own, wholly independent from the categories that describe modern animals. For specialists, it’s obvious that modern animals exist within a continuum that extends into the deep past. It’s also obvious that groups like “mammals” and “reptiles” had starting points, and are embedded within larger, more ancient groups. None of this can be considered common knowledge, but it’s critical to any discussion about the identity or categorization of a given taxon. Box diagrams are a simple and intuitive way to ground students’ understanding of the diversity of life. How can educators hope to cover so much ground without confusing, distracting, or alienating their audiences? One option is to use a cladogram, or evolutionary tree. Trees are absolutely the most precise and accurate way to portray relationships over time, but as Torrens and Barahona demonstrate, they are regularly misinterpreted by the public. When I’m dealing with a general audience, I prefer box diagrams like the one above. Boxes within boxes show tiers of relatedness in a way that is more intuitive and easily understood than a tree. Box diagrams allow educators to cover a lot of unfamiliar ground quickly, and it’s easy to test visitors’ comprehension by asking them to point to where an example taxon should be placed. 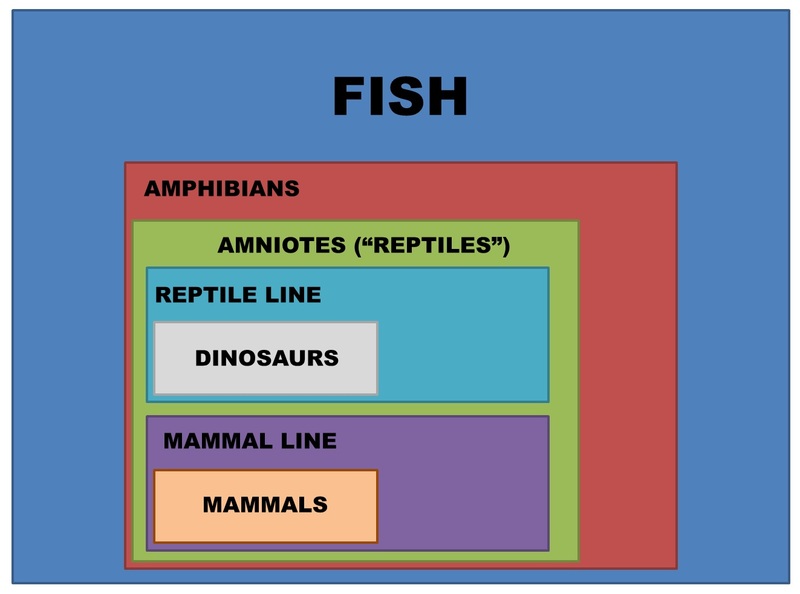 While this visualization of vertebrate relationships lacks a time axis, people can at least grasp the relative order in which each group evolved (fish before amphibians, amphibians before reptiles and mammals, etc). Going back to the list of misguided questions at the top of this post, we can generally surmise the thought process that led to each inquiry. The person who asked if whales and marine reptiles are related was classifying based on shared habitat. The person who asked if giraffes evolved from sauropods was classifying based on similar body shape. We can also see classifications based on diet, and based on shared activities, like flight or attacking prey with clawed feet. All these questions reflect a misunderstanding of what kinds of traits researchers look for when working out evolutionary relationships. So how do we quickly and clearly explain which traits are relevant, and which ones are not? This is a tricky problem, and one I have not found a perfect solution to. The most important distinction is between plesiomorphic and apomorphic traits: plesiomorphic traits are inherited from an ancestral form, while apomorphic traits are novel developments. Put simply, working out a phylogenetic tree is all about grouping organisms based on shared apomorphies. The more apomorphic traits between two species, the more closely related they are. Once introduced, this is a fairly intuitive distinction. You don’t even need to use the jargon – “old traits” and “new traits” will often suffice. 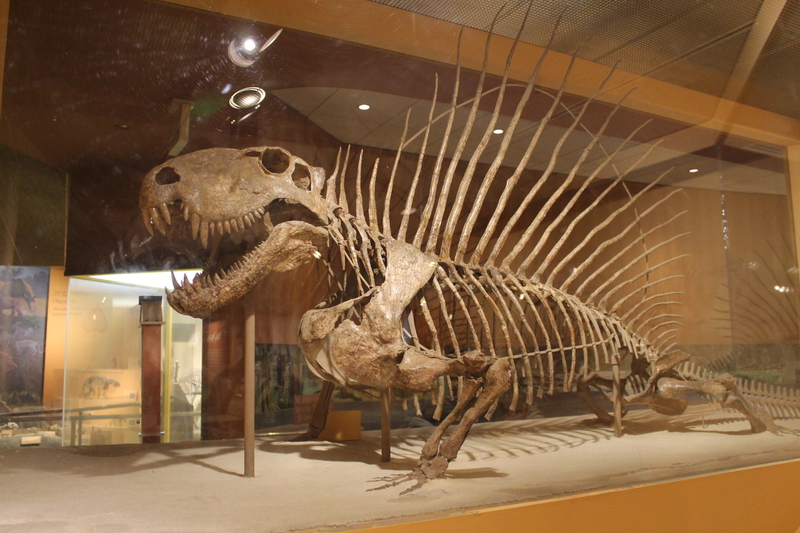 Going back to our problem of defining Dimetrodon, we can clarify that the lizardy shape and general toothiness are “old traits” – so they don’t tell us much about what the animal actually is. Instead, scientists look at “new traits”, like the number of postorbital fenestrae, to work out Dimetrodon‘s evolutionary affinities. All of this is a long-winded way of saying that relating phylogeny to the public is challenging, but very important. Too often, science educators assume visitors have more background than they do, and the discussion comes across as so much moon man talk. Alternatively, educators push past complicated parts too quickly, which leads to confusion or misunderstanding. Ultimately, being a good educator comes down to two things: knowing your content and knowing your audience. Both are equally important, and both need to be practiced and refined in equal measure to ensure successful communication. Macfadden, B.J., Dunckel, B.A., Ellis, S., Dierking, L.D., Abraham-Silver, L., Kisiel, J., and Koke, J. 2007. BioScience 57:10:875-882. Spiegal, A.N., Evans, E.M., Gram, W., and Diamond, J. 2006. Museums and Social Issues 1:1:69-86. Spiegel, A.N., Evans, E.M., Frazier, B., Hazel, A., Tare, M., Gram, W., and Diamond, J. 2012. 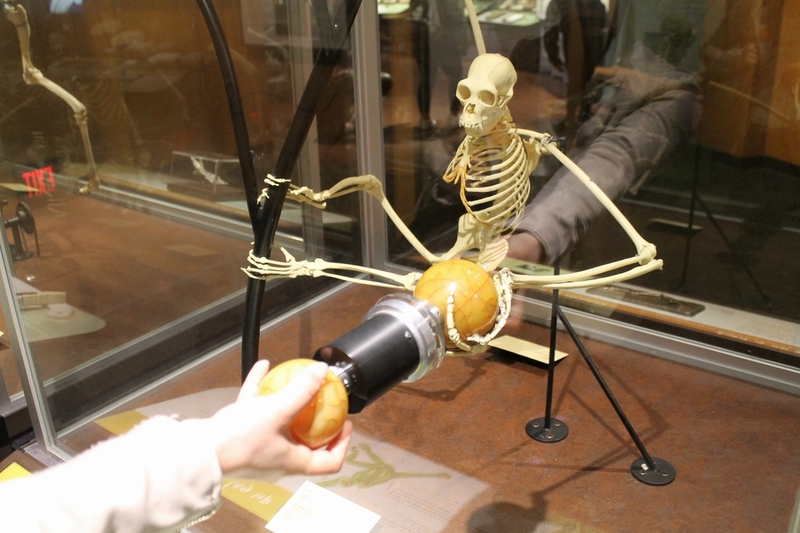 Changing Museum Visitors’ Conceptions of Evolution. Evolution: Education and Outreach 5:1:43-61. Torrens, E. and Barahona, A. 2012. Why are Some Evolutionary Trees in Natural History Museums Prone to Being Misinterpreted?” Evolution: Education and Outreach 1-25. 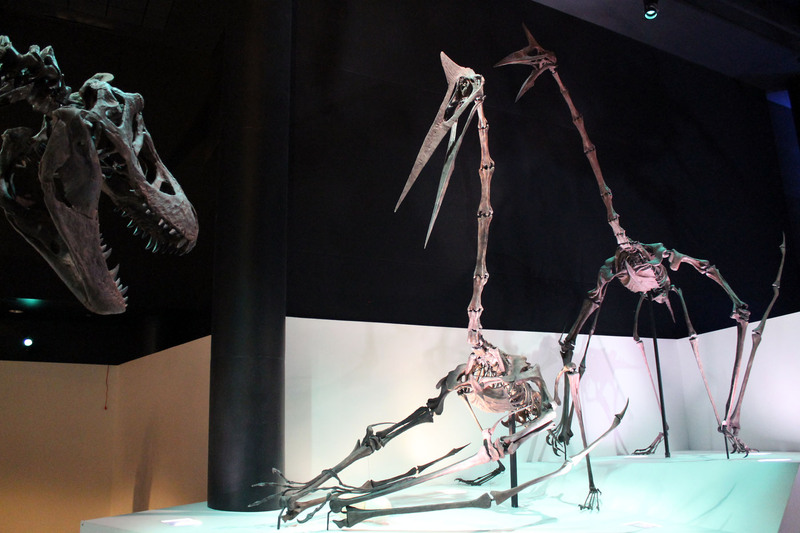 Over the past few months, I’ve been writing about the strengths and weaknesses of various large-scale paleontology exhibits from an educational standpoint. Check out the Introduction, Walk Through Time, Phylogeny, and Habitat Immersion posts if you’d like to catch up. 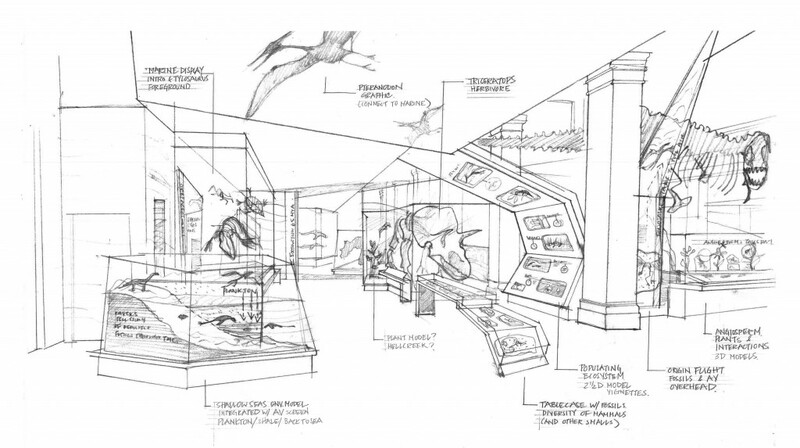 I’ll wrap up this series for the time being with a look at two upcoming renovations of classic fossil displays, which appear to have converged on similar aesthetic, organizational, and interpretive approaches. 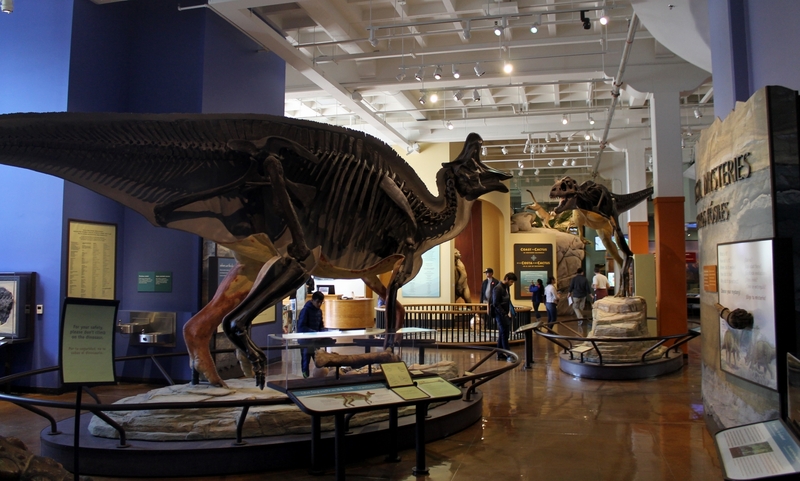 First up is the Peabody Museum of Natural History, where the Great Hall of Dinosaurs and adjacent Hall of Mammal Evolution have seen little modification since the 1950s. 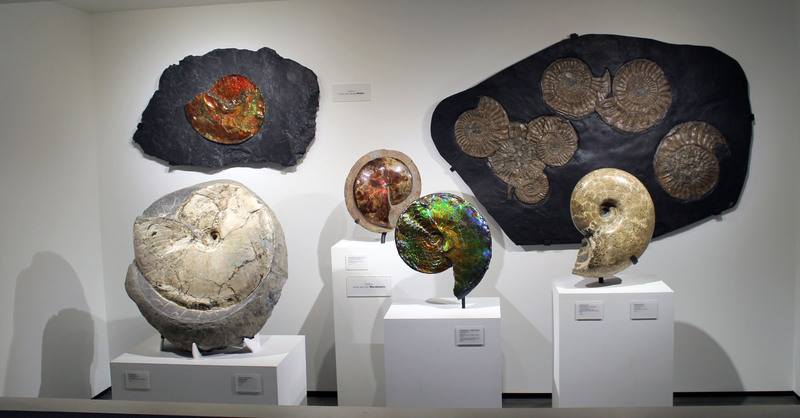 While the PMNH fossil galleries are fascinating as a time capsule of mid-century exhibit design, much of the content is rather dated and a thorough overhaul is sorely needed. PMNH staff started planning for the renovation in 2010, and I highly recommend Collections Manager Chris Norris’s blog posts on the process. 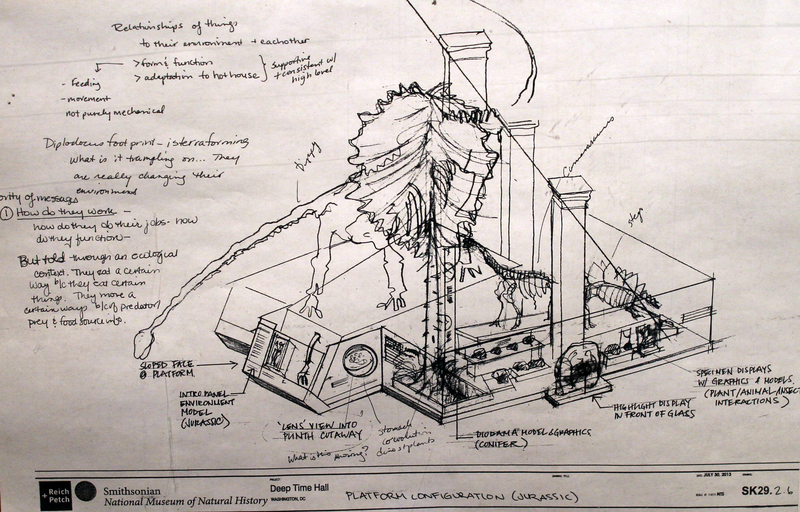 Once the basic layout and concepts were in order, the museum hired the architectural firm Studio Joseph to prepare the images being used to promote the project. Fundraising is now underway, but an estimated completion date has yet to be announced. The big idea behind the new exhibit is the dynamic relationship between the biosphere and the Earth’s various other spheres (atmosphere, geosphere, hydrosphere, etc). The evolution of life on Earth did not occur in a vacuum, but as part of a continuously changing global system. 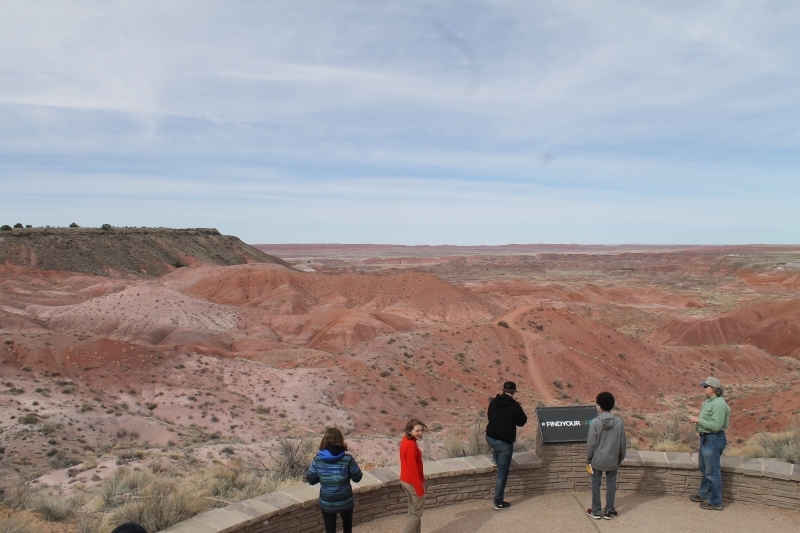 This narrative does have a time axis – visitors will travel from the Permian at one end of the exhibit to the Quaternary at the other – but the precise divisions of geologic time are de-emphasized in favor of the broad environmental transitions that triggered evolutionary innovations. Examples might include the separation of continents during the Mesozoic, the diversification of flowering plants in the Cretaceous, or the massive climatic shift at the end of the Eocene. In this context, it’s more important that visitors understand (for example) that the Cenozoic was generally a transition from hot and wet to cold and dry (and the implications on mammalian evolution) than that they know the names and time spans of each epoch. 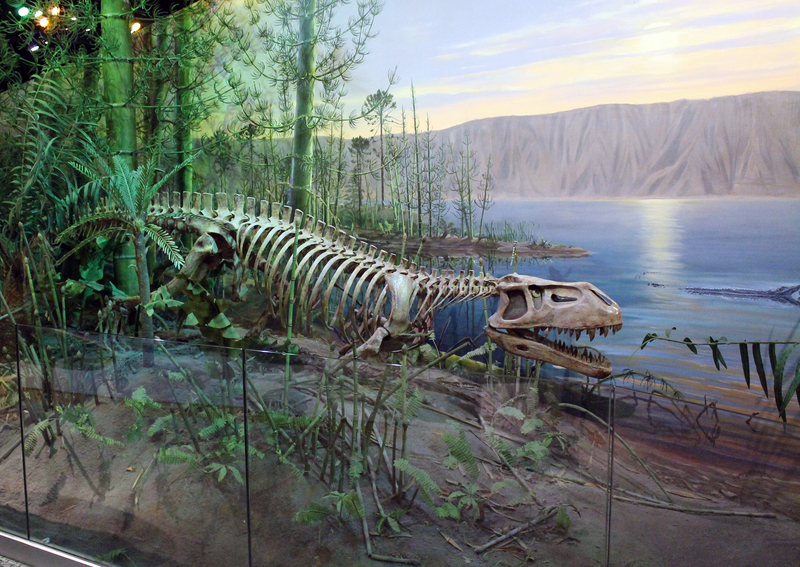 This approach contrasts sharply with traditional chronological exhibits, such as the Field Museum of Natural History’s “Evolving Planet.” The FMNH fossil galleries are extremely linear, and each geologic period is introduced with a set of easily-digested bullet points summarizing what happened during that time. Relatively tight spaces prevent visitors from seeing specimens from other time periods prematurely, and the galleries devoted to each period are color-coded to make them immediately distinct. According to Norris, this segmented presentation of the history of life obscures the large-scale transitions which transcend the somewhat arbitrary divisions of geologic time. 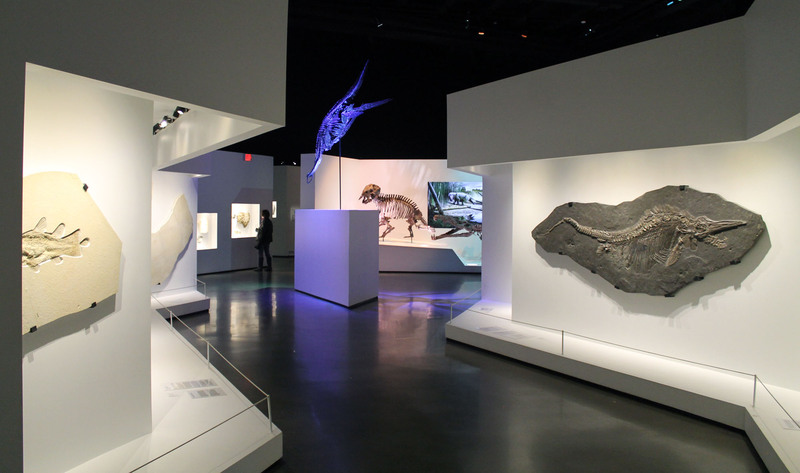 As such, the new PMNH fossil halls will present the narrative holistically, encouraging visitors to track the underlying environmental trends that precipitated evolutionary change over time. As is immediately clear from the promotional images, the new exhibit will juxtapose a modern, wide-open aesthetic with elements of the museum’s past – specifically, the outdated but gorgeous Rudolph Zallinger murals. Both of these design elements tie directly to exhibit’s narrative themes. 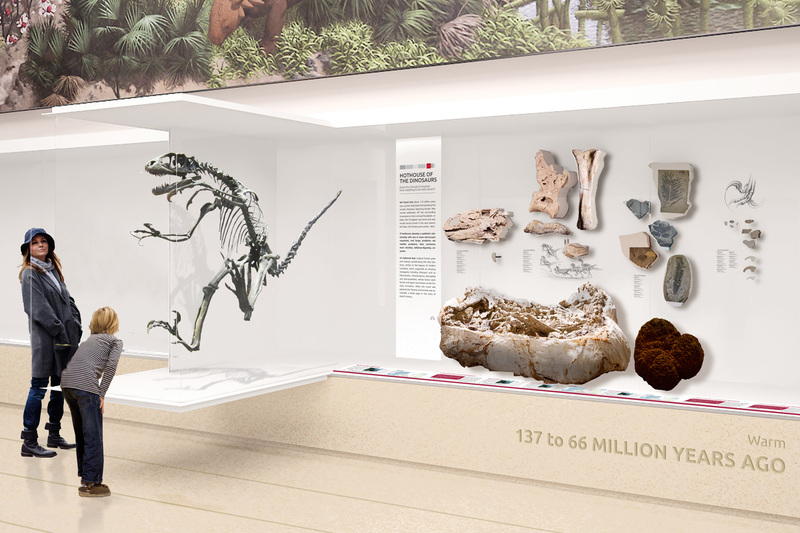 By breaking up the central dinosaur pedestal and eliminating the unsightly glass cases in the Mammal Hall, the exhibit designers have dramatically increased the available floor space and opened up new lines of sight. This should allow visitors to view each of the galleries comprehensively, rather than as a series of discreet segments. Meanwhile, the Zallinger murals will remain a celebrated part of the exhibits. These magnificent frescoes were painted between 1942 and 1967, and are among the most iconic images of prehistoric life ever created. Although the physiology of some of the animals is outdated, Zallinger was in other ways ahead of his time. Rather than giving the geologic periods hard borders, Zallinger artfully wove the sections together so that each one fades imperceptibly into the next. The viewer can see that the flora, fauna, and climate are changing over time, but it’s a gradient, not a ladder, which perfectly reflects the narrative of the new exhibit. About 300 miles south of PMNH, the re-imagining of the fossil halls at the National Museum of Natural History is well underway. 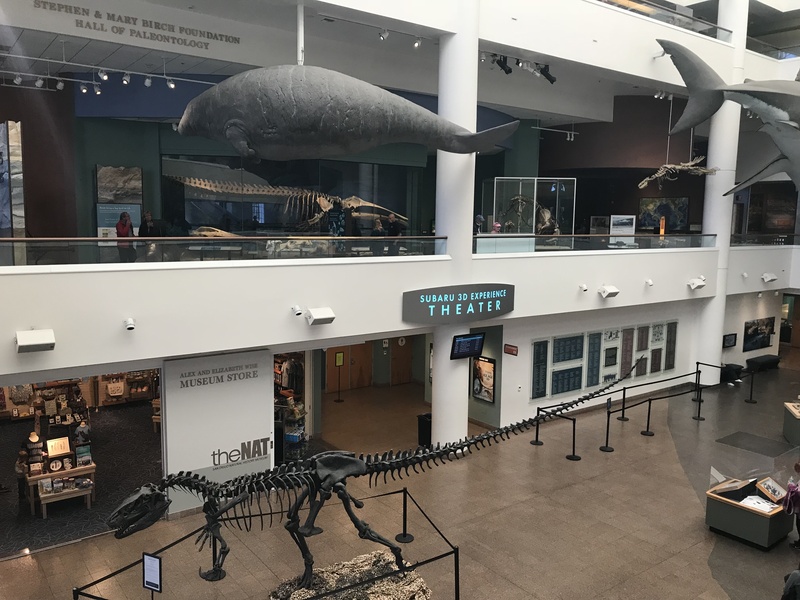 This building’s east wing has been home to paleontology displays since it opened in 1910 and has been updated several times, but this is the first time it has undergone a complete, wall-to-wall modernization. The old exhibits were formally closed on April 28th, 2014, and NMNH staff spent the following year removing thousands of specimens from the halls. With the fossils out of the way, the next step will be to restore the historic space to its original neoclassical glory. 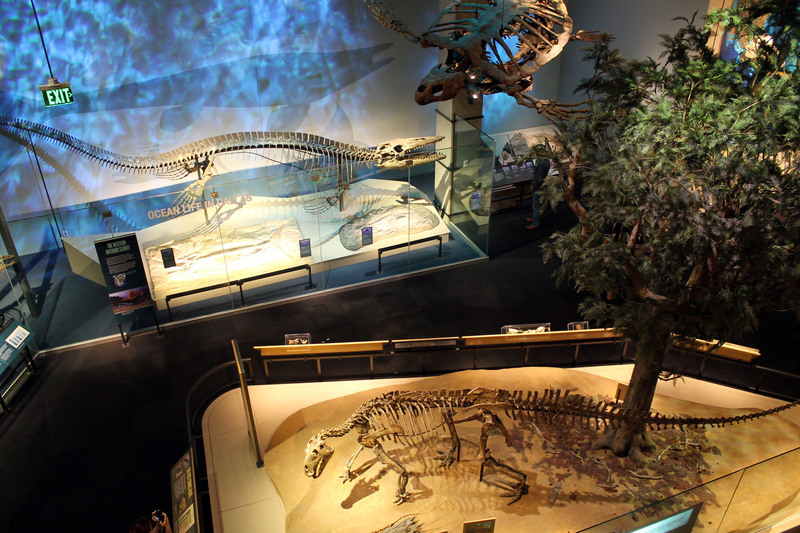 After that, the new exhibits and updated fossil mounts can be assembled in time for a 2019 re-opening. 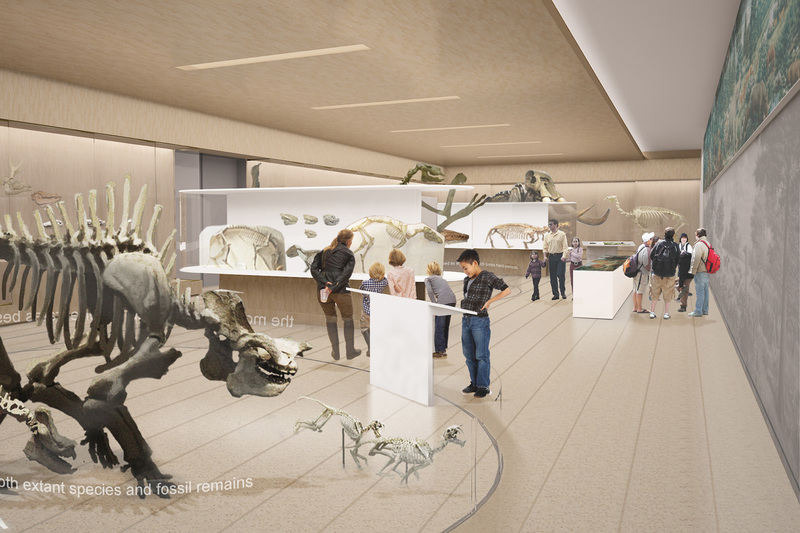 Intriguingly, the planned design of the new National Fossil Hall is both thematically and aesthetically similar to the PMNH renovation, albeit on a grander scale. 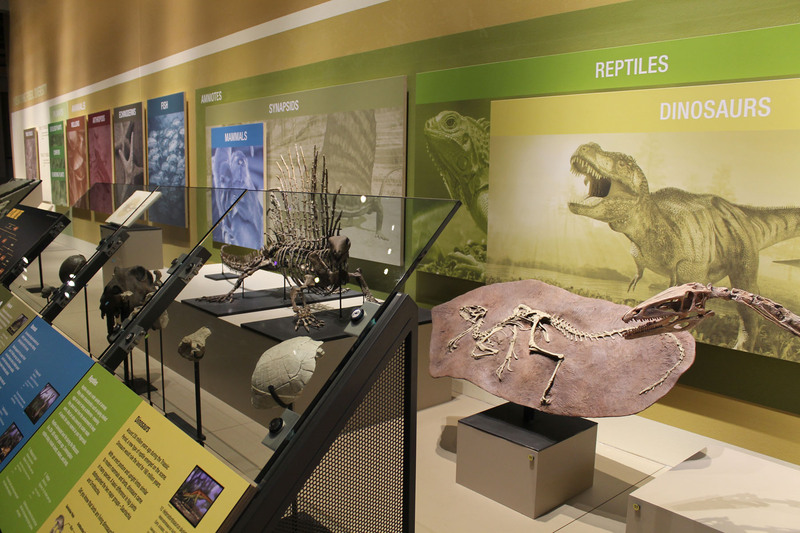 The National Fossil Hall’s narrative focus will be on large-scale environmental transitions over time, and how these changes drove the evolution of plants and animals. 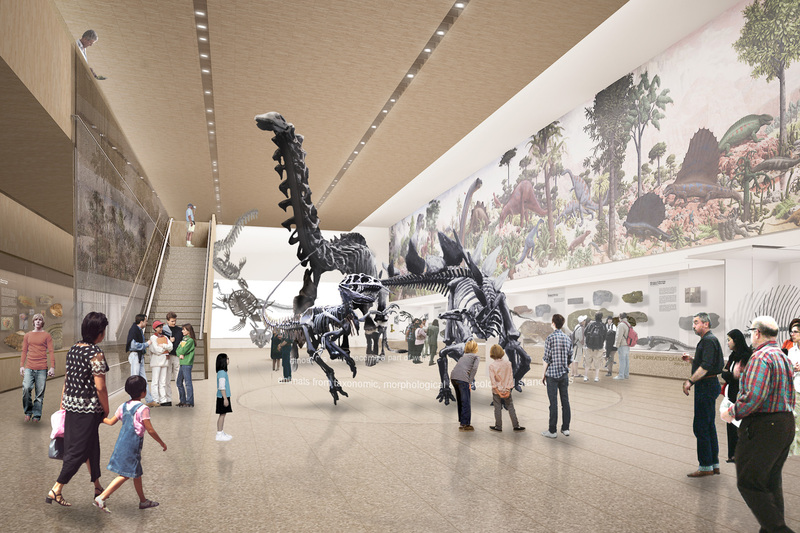 Like at PMNH, this will be accentuated by an open layout: false walls and barriers that have divided the space since the early 1960s will come down, allowing visitors to see clear across the spacious three-story hall. This airy aesthetic hearkens back to the Hall of Extinct Monsters, and like the restoration of the Zallinger murals at PMNH it represents an admirable celebration of the institution’s history. 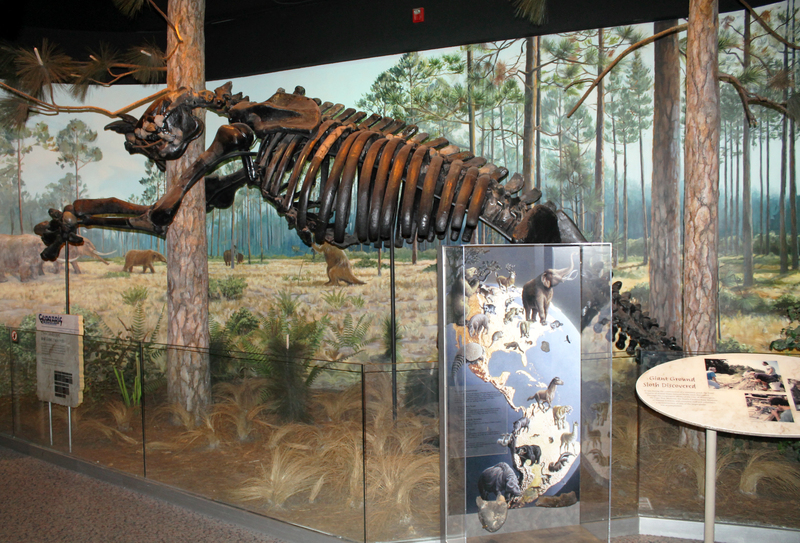 One interpretive choice that will set the National Fossil Hall apart is the clustering of specimens on islands, or “pork chops”, as the were called early in development. Each pork chop represents North America at a particular period in time. While anchored by a few charismatic mounts, the pork chops will also include all manner of small animals, invertebrates, and plants that were part of that environment. In this way, the islands are self-contained mini exhibits, each one showing a complete ecosystem that existed at a particular time. Moving among the these displays, visitors should get a sense of how climate change and faunal interchange (among other phenomena) can completely transform an ecosystem over millions of years. They’ll also learn how certain organisms, like sauropods in the Jurassic or grass in the Neogene, can change landscapes and influence the evolution of contemporary plants and animals. The emphasis on open spaces and freedom of movement is notable, because this is quite different from the linear exhibits of the late 20th century. In recent decades, exhibits have become increasingly structured, with specific learning goals and physical spaces designed to corral visitors through a carefully orchestrated narrative journey. Again, Evolving Planet at FMNH is an excellent example of this philosophy. 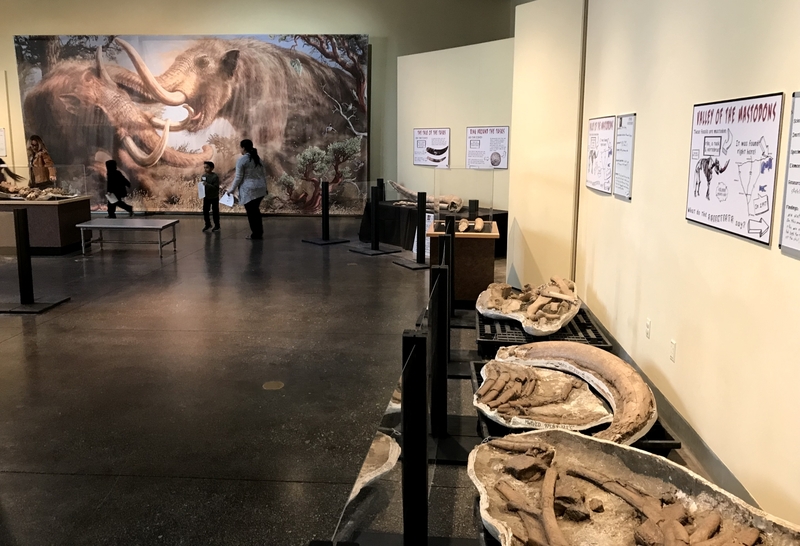 The new National Fossil Hall is in some ways a push in the opposite direction – although it has a clear narrative and overarching message, visitors can roam through the exhibit as they please. I see the pork chop system as a way to have it both ways. 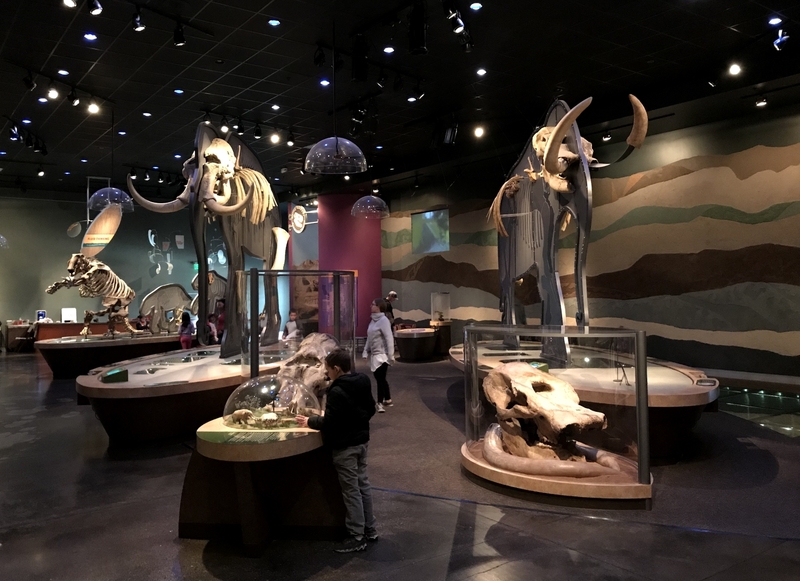 Whether visitors work through the exhibit front to back or run straight to the T. rex in the center of the hall, then wander around at random, they’ll still be able to compare and contrast the different ecosystems and learn what the designers want them to learn. Early concept art of the Jurassic “pork chop.” Image from The Last American Dinosaurs, NMNH. We are in the midst of an extinction event of our own making. Anthropogenic climate change, habitat destruction, and invasive species are as dangerous as any asteroid, and will likely have profound effects on our own lives and livelihoods in the coming century. But while humans are undeniably the cause of the latest round of global changes, we also have the power to mitigate and manage their consequences. 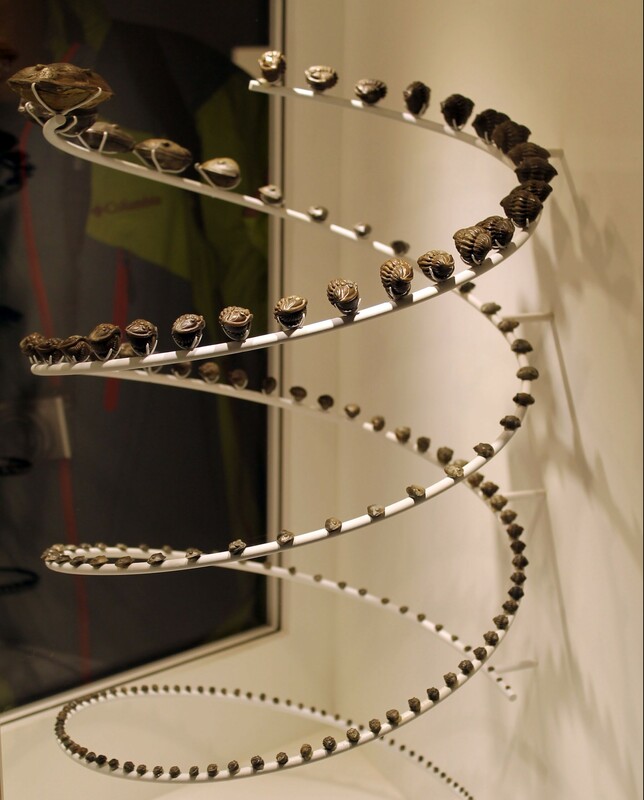 The study of fossils provides important contextual information – we can place modern organisms in an evolutionary context and understand their role in shaping the world as we know it, and we can see how organisms have responded to significant environmental overhauls in the distant past. The fossil record is in fact the only way to directly observe these things (as opposed to relying on models or actualistic experiments). As such, the new National Fossil Hall will make it clear that paleontology isn’t just about historical curiosity. The study of past life gives us a long view of the Earth’s biotic and abiotic systems, and helps us predict how they will respond to today’s environmental changes. 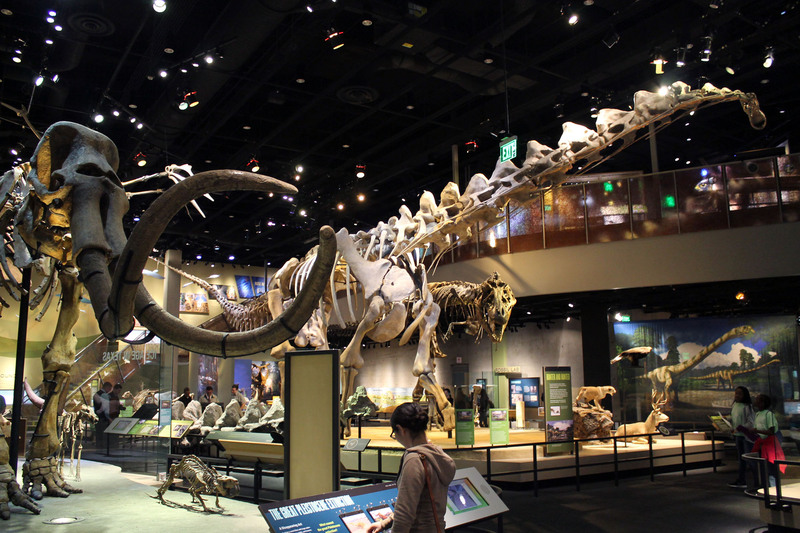 With the modern climate crisis front and center, the new National Fossil Hall has the potential to be one of the most immediately relevant and important paleontology exhibits ever assembled*. This is significant, because as I lamented when I started this series, immediacy and relevance are not things that most museum visitors expect from fossil displays. 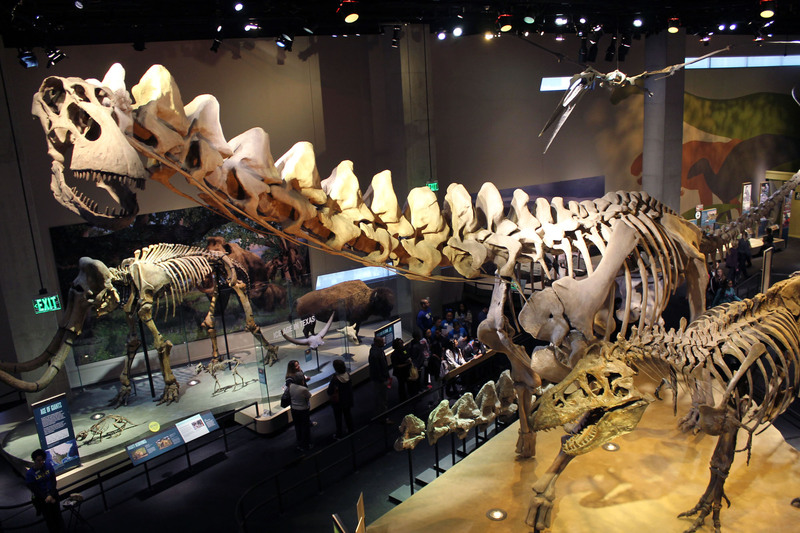 While fossils, particularly the mounted skeletons of dinosaurs and other prehistoric animals, have been central to the identity of natural history museums since the late 19th century, most visitors don’t regard these exhibits as anything more than prehistoric pageantry. Visitor surveys consistently reveal that dinosaurs are seen as eye candy – monsters that might as well be from another planet. This is a shame, because dinosaurs and other prehistoric organisms were real parts of our own world, and we can learn much from them. And so we come full circle. What is the point of a museum exhibit**? 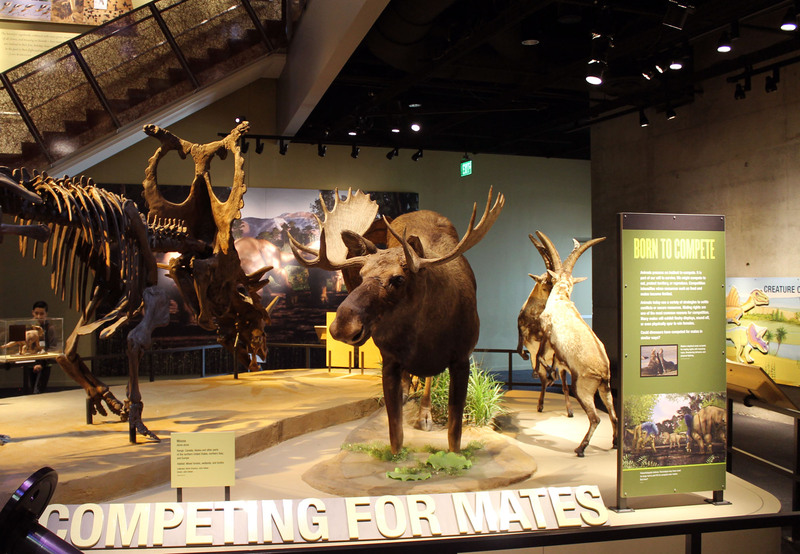 Is it enough to provide visitors an opportunity to see cool objects and specimens? When we ask museumgoers what they want to see, they tell us “dinosaurs” or “fossils.” They don’t ask for compelling narratives or connections to big contemporary issues, and they don’t see their museum visit as an important way to bridge gaps in scientific literacy. Still, it is of critical importance that we provide these narratives and connections. Even if we accept the fact that the very existence of a museum and the chance to see real specimens is a Good Thing, museums are still accountable to the public. Virtually all museums cite education as the primary purpose of their institution, and it’s imperative to live up to that. A museum should have a learning goal in mind, it should be able to prove that this message is coming across, and it should be able to articulate why its audience is better off for it. This is not necessarily easy – exhibits need to be relevant without being condescending or preachy. Exhibit designers need to understand their visitors as much as their content. They need to find a balance between feeding visitors information and providing a customizable experience for diverse audiences. As we have seen, not every exhibit succeeds, but my impression is that we’re getting better at it. *It’s also notable that this climate change-focused exhibit will be on the national mall, given the ongoing politically-motivated opposition to climate science. **Note that I’m referring specifically to public-facing exhibits. There are many good reasons why the ongoing maintenance of natural history collections is intrinsically valuable. Weil, S.E. (2002). Making Musueums Matter. Washington, DC: Smithsonian Books.